Still wasting time and money on scrubbing your steam table pans? Never scrub another pan again thanks to our line of Nylon pan liners! Simply line your pan with one of these disposable liners, serve, and sanitize when finished! They are made of durable Nylon material that provides great performance. Because your food never touches the pan, there is no direct food-to-hot-metal contact, which can scald the moisture out of your food and leave it dried out and tasteless. But when you use a pan liner, your food is kept moister and will taste better than ever. Additionally, the chance of surface contamination is greatly reduced since the food cooked never touches the pan. Not only is this pan liner a time saver in the kitchen, it is also better for your plumbing system. Because this liner can go directly in the trash, you will dispose of all the harmful grease that used to go down the drain and cause clogs and other plumbing issues. These Nylon disposable pan liners are oven and microwave-safe, and can also be used for cold storage. Our pan liners come in many different shapes and sizes to suit every need. They are designed with a temperature range of -100 to over 400 degrees Fahrenheit, making them a great addition to any food service operation. Pan liners ultimately save operators money by eliminating the labor time and cleaning costs associated with greasing and washing your pans. When it comes to labor and cost saving, pan liners are a food service operator’s best friend! Thank you for watching! If you have any questions, please use our live chat button! Nylon pan liners save you time and money in the kitchen. Plus, these liners are disposable; making for an easy clean up! Watch this video to learn more on these nylon pan liners and how they can help you out! Never scrub another pan again thanks to this full size deep steam table nylon pan liner! Simply line your pan with one of these disposable liners, serve, and sanitize! Because your food never touches the pan itself, there is no direct food-to-hot-metal contact, which can scald the moisture out and leave your food dried out and tasteless - when you use a pan liner, your food is kept warmer and will taste better than ever. Additionally, the chance of surface contamination is greatly reduced. They are designed with a temperature range of -70 to over 400 degrees Fahrenheit. Fits full size steam table pans, 4" and 6" deep. These liners are the handiest to have. It makes cleanup a breeze. I do BBQ and I marinate my meat over night and discovered that these liners fit a meat lug perfectly and make cleanup a easy. Will definitely keep these liners around. We love these, they work wonders in full roasters too! We use them all the time, and would recommend them to anyone, and we have! Must have when cooking baked beans or cheesy potatoes in steam table pans! Simply bake, remove the bag and contents, empty the bag into a clean pan, and serve. Makes for a nice presentation and easier clean up. 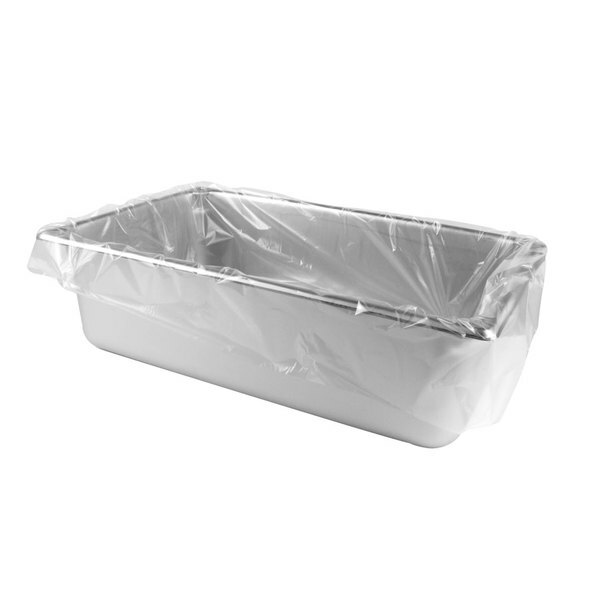 Large pan liners that fit in 16-22 quart crock pots. The liners allow for even cooking and prevent the food from burning when you put water under the liner. They also keep the pot clean saving time as well as wear-and-tear on the insert. I had never before heard of pan liners till a friend mentioned them in December of 2017. I looked to see if they would be available on this website and I found them. I really doubted that they would do what they are advertised to do, so i tried one liner inside an empty pan. I placed in in the oven at 350 degrees for 20 minutes and it did not melt. I love these liners because they prevent the food from touching the pan and so washing the pans is just a breeze. They are excellent as large freezer bags for cooked food too. I was very pleased with this item. They arrived quickly, were as described and worked perfectly for our pans. I would recommend these to others. Great product! This is perfect when serving casseroles, dressing or anything that creates a messy pan that can be hard to clean. This is a great time saver, just remove the liner. We love these liners, they save us from doing a lot of dishes. They're durable and work for multiple uses in our BBQ catering business. Overall It's a good product, but not great. It fits our full sized pans very snugly and A few were torn in the process of getting them into the pan. Once you get the hang go that it is a good product tho. No more scrubbing and scripting up the pans trying to get them clean and when you have waste instead of dumping into trash or clogging drains just lift liner out like a sack and throw away, tie shut and put in dumpster or whatever else you want to do with it. This has saved us cleanup time, prevented extra messes while cleaning these big pans, and drains clogging up with gunk no more! These liners are great. saves on a mess to clean up later. using the deep ones on a shallow pan allows me to totally wrap the pan when i put in the smoker to keep pan from turning. Glad i got these. These were used during Thanksgiving 2009 at a large church function and made clean-up so much easier. I questioned whether they would stand up to the oven's heat, but it worked beautiful.